Historical Development: Gombe State, "Jewel in the Savannah," was created on 1st October, 1996 by the General Sani Abacha administration. Its creation was a fulfilment of the aspirations of the people who, for long, had been yearning for a state of their own out of the then Bauchi State. The genesis of the struggle dates back to 1979. Since its creation, the state has been growing fast, blessed with abundant physical, human and economic resources. One of the criteria for an area to qualify for State creation is economic viability. There is no doubt that Gombe fulfiled that criterion. It is a confluence of economic activities, by its position as the meeting point for business people from the surrounding states. The states include: Borno and Yobe to the north and east, Taraba and Adamawa to the south, and Bauchi to the west. This advantage has made the state vibrant in all respects. In addition, the land is blessed with natu ral resources, while the people are highly industri ous and enterprising. Thus, within the short period of its existence, it has made tremendous progress. Location and Size: Gombe State is located between latitude 9�30' and 12�30'N and longitudes 8�45' and 11 �45'E of the Greenwich Meridian. 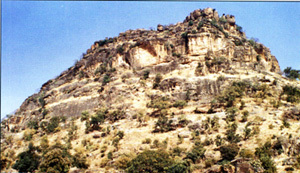 It lies within the NorthEast region of Nigeria and occupies a total land area of about 20,265sq. km. The state had, by 1998, an estimated population of 1,820,415 inhabitants. Administrative Areas: Gombe State comprised eleven Local Government Areas (LGAs) in 1999, the same number created in 1996 (see Map151 Gombe State Administrative) However, some of the LGAs, notably Akko, Dukku and Gombe have been in existence since 1976, as part of the then Bauchi State. and chiefdoms as Gombe, Tangele and Waja. Gombe town is the administrative capital of the state, as it has been for the Emirate, the seat of the Emir. Its population of about 200,000 makes it the largest centre in the state. It is also the commercial and zonal services headquarters in Nigeria for many Federal Government establishments, includ ing NNPC.NEPA, NITEL Territorial Office, NIPOST Territorial Office and Nigerian Railway Corporation.